Amazing first ever image of Jupiter taken in infrared light on the night of 17 August 2008 with ESO's Very Large Telescope. This false colour photo is the combination of a series of images taken over a time span of about 20 minutes, through three different filters. The image sharpening obtained is about 90 milli-arcseconds across the whole planetary disc, a real record on similar images taken from the ground. This corresponds to seeing details about 300 kilometers wide on the surface of the giant planet. "Our human window on the Universe is terribly small within a stunningly small range of wavelengths. With our eyes we see wavelengths between 0.00004 and 0.00008 of a centimeter (where, not so oddly, the Sun and stars emit most of their energy). The human visual spectrum from violet to red is but one octave on an imaginary electromagnetic piano with a keyboard hundreds of kilometers long," according to astronomner James Kaler. Our eyes cannot register wave photons no matter how powerful they may be. Longer than the visual wavelength limit — up to about a millimeter — lies the infrared. Longer waves, into kilometer-wavelengths toward the unknown end are what we call "radio." At the short end is violet, with orange, yellow, green, blue and hundreds of overlapping shades. Shorter than the visual limit are the ultraviolet — all running in the vacuum at the speed of light. At less than a percent of the wavelength of visual light are X rays, and at a factor of 100 smaller are the deadly gamma rays. One of the great achievements of modern astronomy is the extension of "human sight" — opening the electromagnetic spectrum to our view and discovery beginning in the 1930s with radio astronomy and ending with NASA's great fleet of space observatories and the Fermi Gamma-ray Space Telescope (FGST, formerly GLAST), working to unveil the mysteries of the high-energy universe. Launched into orbit on June 11, 2009, FGST studies the most energetic particles of light, observing physical processes far beyond the capabilities of earthbound laboratories. The great red spot is not visible in the infrared image of Jupiter as it was on the other side of the planet during the observations. The observations were done at infrared wavelengths where absorption due to hydrogen and methane is strong. 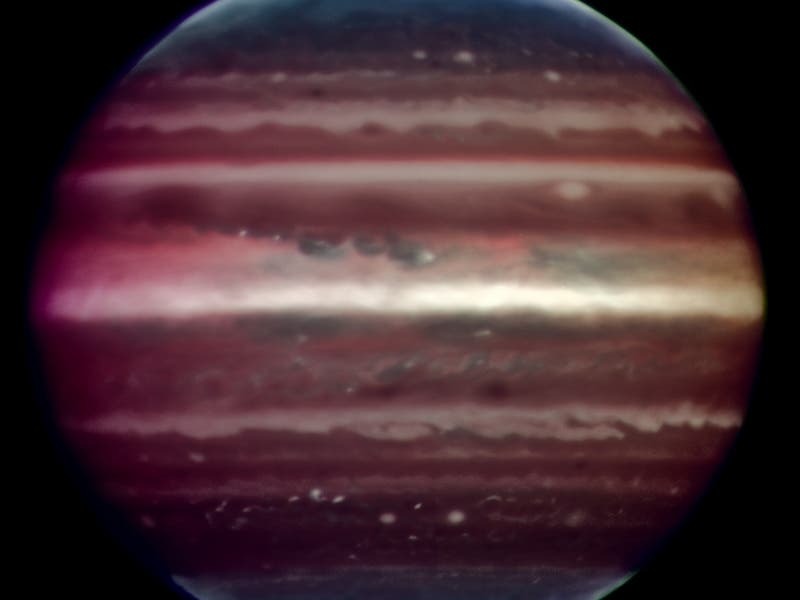 This explains why the colors are different from how we usually see Jupiter in visible-light. This absorption means that light can be reflected back only from high-altitude hazes, and not from deeper clouds. The hazes lie in the very stable upper part of Jupiter's troposphere. Mixing is weak within this stable region, so tiny haze particles can survive for days to years, depending on their size and fall speed. Additionally, near the planet's poles, a higher stratospheric haze (light blue regions) is generated by interactions with particles trapped in Jupiter's intense magnetic field.